Curb appeal is universal. Whether or not a home is for sale, you know it’s a looker when cars drive by more slowly than usual, when fingers point at the gorgeous antique windows along with nods of agreement, or when the occasional pedestrian might stop to take a good long look. The character of a home’s exterior can say a lot, and this tool is especially helpful when it is on the market. 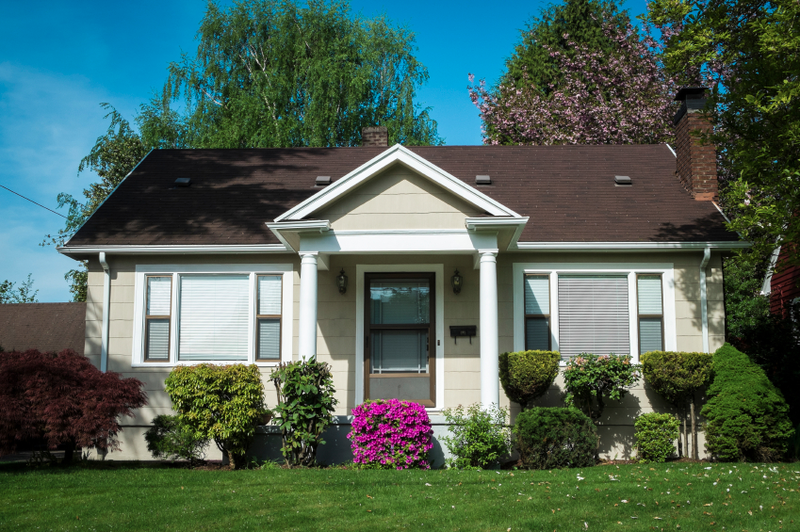 However, don’t be mistaken by thinking that curb appeal is an expensive renovation or brand new siding. Curb appeal shows when a place is taken care of and has a little extra something that shows it’s not just someone’s house but a home. When it comes to creating curb appeal, even the littlest shrub can make a significant impact. Nice landscaping makes your home more attractive at first glance, which is helpful when it’s on the market. This can certainly be an affordable upgrade, but don’t be afraid to spend a bit more than you might like on plants and greenery—keep in mind that it will be an investment. Planting shade trees by your home will eventually help to decrease your cooling costs and make it more energy efficient—which is something any passerby will be able to notice. Plus, it’s always a good idea to plant trees, as they release more oxygen into the atmosphere, and it’s even better when it saves you money. Win-win. One of the best things that you can do to market a home is to give its exterior some love with a little bit of upkeep. Buyers don’t want to have to look at a potential new home and imagine what it would look like if they purchased it—they are more likely to fall in love with a well-kept home that looks more like the final product than a future project. So trim the grass, make sure the lawn looks healthy and taken care of, add new mulch to the garden, and then take a close look at whether or not any architectural details of the home are blocked by the greenery. For example, if you have bushes in the front of a home that are overgrown and blocking beautiful shutters or a nice outdoor windowsill planter, then trim them back. This will draw people’s eyes to the unique and special details of a home that give it undeniable curb appeal. There are so many bigger ticket items that get all the attention in a home, that sometimes the smaller and just as important details are overlooked. Often times, it’s these small and affordable updates that make the biggest impact by giving the place some extra character and charm. Sure, that two car garage is great and the driveway was freshly paved not so long ago, but what about the walkway into the home that could use a good power wash? Or perhaps the old wooden mailbox is starting crumble and fall apart, but when it’s given some paint and a little extra attention it might make a potential buyer look twice. Plus, nothing says “welcome home” like an inviting doormat. So go ahead and give those house’s numbers a little spit shine—it just might be what sells it in the end. Giving a home a little more sparkle and shine is both easy and affordable: Wash and scrub the windows so that they gleam, put in new lightbulbs for the outdoor lights, and polish the doorknobs or knockers. A trick of the trade from some savvy realtors is to turn the water sprinklers on about thirty minutes ahead of a showing so that when the buyers come to take a look, the lawn looks lush and vibrant.